Now, to clarify that I call replicas poor "fakes", where as you call me good replicas, "replicas". I own both a "fake" Louis Vuitton and a "replica" of Louis Vuitton. My fake is not terrible, but it's obviously false, since it's a bag that LV never made. Which brings us to our Top Ten list of how to spot a fake Louis. 1) Know Your Bag - My fake Louis Bag was never made by Louis Vuitton. A clear indication that the bag is fake is that it does not "really" exist. 2) Painted camel handles should be painted red at the seams. 4) "O" must be perfectly round. Ovals indicate false. 6) Know the lining of your bag. 7) Sewing should be perfect. LV destroys products of inferior quality. 8) LV has no labels of any kind attached to a bag. 9) Know the packaging of your bag, ie the appearance of the dust bag, care booklet, LV card, etc. 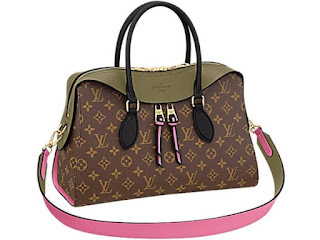 10) Most Louis Vuittons are made from a single piece of leather. If there are seams in the middle of the bag, etc., this is indicative of a forgery. Also because many pieces are made of a single piece of LV leather logos can appear face down on the back of the bag. Do the research to find out if the bag is one of these bags.